… Good timing for the question as I have been trying to work out how to express the concept concisely. I am sure you have found long descriptions like the one at http://www.bain.com/publications/articles/calculating-the-economics-of-loyalty-forbes.aspx. 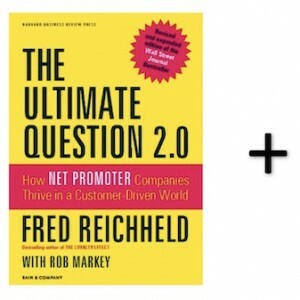 You may also have read what I have written on the subject in my NPS book Net Promoter – Implement the System. Cost of acquiring a new customer compared to cost of keeping an existing one. In an ideal situation, your sales people bring in new customers, while the sales process for renewing existing contracts is mainly administrative and costs a lot less. Divide the total revenue from new customers by the total sales and marketing budget, and you have the cost proportion for the first part. A similar calculation can be used for renewals. The two are often difficult to separate, and you may need to estimate the proportion of sales people’s time selling to existing customers. The profit margins from existing customers, versus new customers: This probably matters as much as the first point. Happy existing customers tend to pay close to full price. Unhappy customers tend to get price reductions. New customers tend to pay less than existing customers, at least for B2B. Thank you for the many comments whether received directly, via LinkedIn or on Twitter. I wrote four articles in all. Newsletter subscribers received a long one, with details of the methodology. Note that I had to update it slightly due to an error I found in an Excel formula. The updated article is in the blog list below. The second article gave the lists of companies who were in the top 10% for both cusotmer and employee satisfaction, and those in the bottom 10%. The third article provided the counter-intuitive lists, meaning companies in the top 10% for one factor and the bottom 10% for the other. LinkedIn and Facebook are two of the four companies whose employees love them while their customers hate them. I doubt Facebook’s latest tribulations will change that. You will also see a short summary of the new information on the blog list below. Most people who gave feedback were positive and appreciated that employee happiness and employee engagement are two different concepts. Employees can be happy about many things that have nothing to do with customers. Two reactions I received were in the ‘my anecdotes trump your data’ category, meaning they just did not want to believe the data. And one, unfortunately was just “My data says the opposite” without any indication of what that data is or where it comes from. I would love to have been able to see it. I really don’t want to believe that employee satisfaction counts for nothing in most businesses. However, that’s what the data suggests. Here are the large US businesses that everyone (customers and employees) love, and the ones they both hate. This article is intended for readers who remember last year’s article or have read the corresponding chapter in our book Customer Experience Strategy – Design and Implementation. Others should read the longer version below. This article is an updated version of what I wrote on the same subject a year ago. The results continue to be surprising and to go against what most people think. If you remember the details of last year’s article, the short version may be enough for you. Great article by Alyona Medelyan on how to use web scraping and text analytics to understand what your customers are thinking. Truly an innovative approach. You can read it here. An Australian article about the main findings of the 2018 Starcom Media Futures report. And that gap has almost doubled since last year. Read more here. I am currntly trying to suggest how a large sports association with three million members should go about getting feedback from its 60 national associations. I have never done anything like this before, so any relevant experience you have would be most welcome. As explained in my last article here, I have completed my second annual study of the relationship between employee and customer satisfaction for large US companies that sell to consumers. The results confirmed my conclusion that there is almost no relationship between the two for most businesses. The study also allowed me to understand which companies have both customers and employees that are very happy, and those where both are very unhappy. My meta analysis covers 345 large US companies. I have used the American Customer Satisfaction Index data to measure customer satisfaction, and Glassdoor numbers to measure employee satisfaction. The two tables below show the companies that are in the top 10% on both lists, and those in the bottom 10%. The companies in the upper table are listed in descending order of ACSI score. For the lower table the sequence is from worst ACSI score to best. ‘Touch’ refers to the relative level of contact customers have with company employees. If I were looking for a job, the companies on the upper list would be my priorities. And as for those on the lower list… well… Surely it must be frustrating for their boards and leadership teams to know that so many customers and employees hate them. Mind you, some of these are semi-monopoly businesses, so maybe they just don’t care. Remember that employee satisfaction and engagement are two different things. People can be happy with their pay, the distance they have to drive or walk to work, and the food in the company cafeteria. None of these do anything for customers. There is no standard metric for employee engagement, making it difficult to study. As always, feel free to disagree below or by contacting me at mfg@customerstrategy.net. The rabbit drawing is of course by Peter FitzGerald and is the cover illustration for our book of his business drawings “So Happy Here” which is available from Amazon. Next time: the counter-intuitive lists, meaning the companies whose customers love them while their employees hate them, and vice-versa. This article is intended for readers who remember last year’s article or have read the corresponding chapter in our book Customer Experience Strategy – Design and Implementation. It will be difficult to understand without the context provided by the longer article. The full post is here. The 2018 study confirms the 2017 finding that there is a very weak relationship between employee and customer satisfaction. The study used data for 347 large companies that sell to US consumers. Customer satisfaction data came from the American Customer Satisfaction Index reports. Employee satisfaction came from hundreds of thousands of employee satisfaction ratings of the same companies on glassdoor.com. Industries with a high level of face-to-face human contact between employees and customers are exceptions and have at least some relationship between the two factors, though less than most readers would expect. The ‘R2’ value in the graph below is the linear regression result for the relationship between the ACSI and Glassdoor data across all 345 companies. The number means that variations in the Glassdoor score explain 4.4% of the variations in the ACSI score. Last year’s number for 336 companies was 0.00853, or 1% in round terms. I used my own judgement to identify 125 companies as high-touch, meaning employees regularly interact with customers. Variations in Glassdoor scores explain 9.6% of the variation in ACSI scores. Last year’s number was 3.4%, for 117 companies. For the remaining 220 companies, variations in employee satisfaction explain 5.1% of customer satisfaction. Last year’s number was 1.1% for 119 companies. High-touch companies are concentrated in the transportation, retail and accommodation sectors. Here is a table that gives the linear regression scores by sector from the study. 0.313 for the Transportation sector means that variations in Glassdoor scores explain 31.3% of the variation in the ACSI scores, for example. Employee happiness does not drive customer happiness in the majority of companies. Happiness and engagement are difference concepts. People can be happy with their pay, commute to work, the food in the cafeteria and other factors that have nothing to do with customers. There is no standard way of measuring engagement, though all metrics I have seen support the theory that highly-engaged employees produce superior results for customers. For more information and the location of the data files, please consult the full article here. This article is an updated version of what I wrote on the same subject a year ago. For those who remember that post, or already understand the background and references to other research on the topic, I have written a simple summary that you can find here. I don’t believe it will be possible to understand the summary version if you have never read the full article. First, is there any evidence for what most people believe? It is obvious to everyone who works on customer experience that happy employees make happy customers. But… is there actually any evidence for this? Not much, though you would not know it at first. This research I report below was completed in March 2018 and confirms a study I performed a year earlier. In March 2017, I used a new method to study the relationship between the two factors, using public data sources. 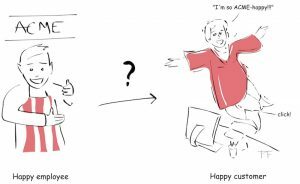 In short: happy employees do not make customers happy. Nor do unhappy employees. Some industries appear to be exceptions. Overall, employee happiness explains 4.4% of customer experience variations across 345 businesses that sell to American consumers. I believe one reason for this low percentage is that many companies have no direct contact with their end customers. What this means for most businesses is simple: your customer experience investments should be concentrated on other things. To find out what things, ask your customers. Try an online search for ‘Employee and customer satisfaction.’ Most results are about employee engagement rather than satisfaction. As this is written, the top result is Employee engagement: the wonder drug for customer satisfaction, on the Forbes website. The author, Kevin Kruse, provides a link to a list of over 30 studies that are intended to be relevant. They make excellent points on employee engagement, which differs somewhat from employee satisfaction. However, only one of them contains multi-company deep research. More on this below. Other studies cover individual companies, including one on Caterpillar, and one on an unnamed department store, for example. Most of the studies listed make no mention of customer experience at all, but focus on other business outcomes. Yes, more engaged employees produce better financial outcomes. Employee engagement indices are calculated as an average of answers to multiple survey questions. At HP, it was an aggregate of eight answers, including questions about training, processes and procedures, and ongoing feedback. There is no standard measurement. The Temkin Employee Engagement Index asks three questions, none of which is about happiness. Employee satisfaction and employee engagement are different concepts. The Forbes article links to research by the Northwestern University Forum for People Performance Management and Measurement that is the only one of the list of 32 that actually includes deep and relevant research. The team studied 100 companies in the media industry. They did indeed find a statistically significant correlation between employee engagement and customer satisfaction for the companies studied. The R2 number from their analysis was 0.08, meaning that 8% of the variability in customer satisfaction is explained by the employee-satisfaction data. When discussing the state of this research in various internet forums, I am systematically told that I am wrong about it. When I ask for proof that I am wrong, I am pointed at articles that the person ‘correcting’ me has usually not read or understood. Indeed, as often happens in scholarly papers, the writer has read the abstract of an article they refer to, but not the full article. I don’t feel this is the place to go into extreme detail on the subject, but would still like to pick one example, just to be clear that I am not making this all up. I don’t exclude the existence of good research. I just have not been able to find it. I admit that some research is only available for a fee, and I have not been willing to go that far. H. James Harrington made a lot of people uncomfortable in 1998 when he published Happy Employees Don’t Equal Happy Customers in the American Quality Digest. He used the American Customer Satisfaction Index (ACSI) numbers for as many of the Fortune ‘100 Best Companies to Work for’ as possible the time. Only five of the Fortune list were in the top 100 of the ACSI list. Surely his results were a fluke, or were not logical in some other way? In short, there is a very weak relationship between employee satisfaction and customer satisfaction. I was able to match 345 ACSI ratings with corresponding Glassdoor ratings. Using linear regression, just 4.4% of the variability in customer satisfaction is due to employee satisfaction. For the stats experts, the number does not change with quadratic regression. I used my own judgement to define some industries, such as restaurants, as ‘relatively high-touch’. This gave a list of 125 such companies. I call the remaining 220 companies ‘relatively low-touch’. Using linear regression, employee satisfaction explains 9.6% of the variation in customer satisfaction, compared to 5.1% in the low-touch group. Using quadratic regression, the numbers rise to 16.0% and 6.9% respectively. The numbers are highly statistically significant. This means they should be representative of all large companies whose end customers are US consumers. Whichever regression method is used, the message should be clear: for two-thirds of companies, employee satisfaction does not matter much. For the high-touch companies, it matters less than you might expect. The ACSI data is grouped by industry and the industries are grouped into ten sectors. The number of companies in each industry is relatively low, so it is hard to be confident in the correlations at that level. (I say this based on paranoia, despite noting that the results are similar to those from last year, and that most large companies in each industry have been covered.) The numbers are more meaningful by sector. It should not be surprising to see the sectors with the greatest amount of human contact at the top of the list. The transportation sector has the smallest number of companies on the list. It includes nine airlines, and three transportation companies (UPS, FedEx and the US Postal Service). The 0.313 R-squared number for the transportation sector, for example, means that 31% of the ACSI variation is explained by the Glassdoor variation. For the sectors at the bottom of the table, there is no apparent relationship between the two. I don’t find these results surprising at all. Almost everything you read on this subject is anecdotal. It is easy to find articles on single employers who make both their customers and their employees happy. Nobel-winner Daniel Kahneman has written about ‘What You See Is All There Is’ as a common cause of misinterpretation. Where the only data being presented is on customer and employee satisfaction, humans jump to an unconscious conclusion that these are the only factors that matter. If you were to start by brainstorming all possible things that could impact customer satisfaction, employee satisfaction would be on the list along with a lot of other potential factors, such as product quality and brand image. Most articles you read on the subject of the current research just present the two factors, leaving you to conclude that only these two are important. I am not going to say employees don’t matter at all. They just don’t matter much for the average company. Think about the number of companies you like where you have no interaction with the employees at all. This is the case for most eCommerce interactions, for example. Amazon is an outstanding customer experience performer for eCommerce, but just about average for employee satisfaction. One potential objection to some of the data points in the study is that the Glassdoor data is provided by employees of the company, while consumers may actually interact with franchisees or other resellers. This would be the case for General Motors brands included in the study, and for some restaurant chains for example. There is no known public source of employee satisfaction data for franchisees and resellers. If you brainstorm a list of possible factors that could impact customer satisfaction, employee happiness deserves a place on the list. So do many other factors. In one such brainstorming session a senior manager suggested that the financial health of a supplier is an important factor for large corporations engaging in long-term contracts. I suspect it would be easy to come up with twenty or more factors that could bear scientific investigation. As far as employee satisfaction is concerned, my hypothesis is that it matters most in high-human-touch businesses. There is a major challenge in proving this. Many large companies outsource their service and sales call center operations, for example, so the ‘high human touch’ is not being handled by company employees at all. Finally, if you would like to do your own analysis, visit our ‘Resources’ page here to download the Excel file and a PowerPoint presentation. I also put the presentation on LinkedIn SlideShare here. When doing your own research on the subject, bear in mind that employee engagement and employee satisfaction are different concepts. And as always, drawings are by Peter FitzGerald. If you like this article, please be sure to sign up for our newsletter here. This new content is also in our book Customer Experience Strategy – Design and Implementation. If you already have a Kindle version of the book, you should have received an automatic update as of March 7th. The print version has also been updated. All four of our books are available on Amazon. As mentioned last week, I was the MC for a webinar about AI and CX on Tuesday. I think it went well, though I am not very objective, of course. The people providing most of the content were Dr. Alyona Medelyan, CEO of Thematic software (www.getthematic.com) and Nick Stroud, Director of Brand Loyalty at ManpowerGroup. We started with a refresher about what Artificial Intelligence, Machine Learning and Deep Learning are, and the role of Natural Language Processing in each. We covered a number of AI examples, including how ManpowerGroup is using Chatbots in customer experience. Alyona covered the latest relevant developments in AI, focusing on a concept that was new to me: ‘Prescriptive Analytics’. This means analytics that not alone tell you what is going on, but also provide information on what you should do about it. Nick showed how ManpowerGroup has put this into action with their two main groups of customers. I found it all to be quite insightful, and I learned some new things, including how the Chinese equivalent of Uber has found ways to improve customer experience for people who are still in the car. See what you think. You can access the replay by filling out the form here. Earlier this week, I spoke to a very experienced Customer Succcess team leader that I had not met before. She told me a pretty sad story that took place a couple of years ago. Her very large employer had a Customer Success team of over 50 people. A new manager came in two layers above hers, around the time the corporation needed to reduce costs. The person did not understand what the team did, and completely eliminated it. After discovering the problems that caused, the company had to rebuild a new team from scratch about a year later. Make sure senior leaders talk about your work. If they are not already doing so, supply them the necessary material. If someone else writes their all-employee messages and prepares their presentations, meet with that person and provide them with the necessary compelling collateral. They want to talk about customers, so will welcome it. Ensure that the names of your teams and projects are clear, and reflect what the work is. Deliver something every two or three months that is clearly worth the effort and investment. Ensure you are able to communicate your work clearly, both internally and externally. I just call these ‘The four rules of sponsorship’, and have written about them extensively in our books and elsewhere. Here are the latest posts. The first two are in a series of three about types of teams you may want to implement if you are designing a new customer experience strategy for your company. Older posts are still available on the blog page. Micro Focus gained its initial success by producing a version of COBOL for the PC. I believe COBOL is still the most common programming language used on mainframes in large banks. COBOL programmers tend to be even older than me, so there will be a problem at some point. More recently, Micro Focus acquired the software division on Hewlett Packard Enterprise, where I used to work until retiring two years ago. In this interview, Cvetilena Gocheva talks to Dr. James Borderick, who leads customer research at Micro Focus. He descibes how they have implemented NPS and makes some valuable points about the importance of talking to Passives. You can read it here. I promise this is just a coincidence. Both articles I found interesting this week are on the same website. I have no commercial relationship whatsoever with the site, or its owner, CustomerGauge. In this article, Sarah Frasier discusses Barclays’ approach to improving customer experience. She explains the interesting relationship between their customer experience and financial goals, and you will see a photo of one of their customer interactions on a smartphone. Read it here. As forecast last week, January has been a record month for our book sales, by a considerable margin. This applies to all three categories: Kindle, print, and the page reads in the Kindle Unlimited / Kindle Online Lending Library services. Thank you! And we would of course appreciate you writing a review on Amazon, no matter what you think of the books. Here are links to the books on Amazon.com. Other than that, I realize many companies have cost reduction objectives, and that I have not written enough about ‘customer-centric cost reduction’ recently. I will work on that. Following on last week’s article about Customer Success teams, here are a few words about Customer Advisory Boards. Members should be senior executives with similar job responsibilities. The closer the members’ profiles are to each other, the more they will enjoy getting together. Indeed, they are likely to continue their conversations between any meetings you may organize. I suggest having no more than about eight members. If you have more large customers, organize multiple boards, ideally by industry. The opportunity to meet their peers in other companies. Ensure you provide long, indeed very long breaks so they can interact informally. Don’t let any agenda item interfere with the break times. The opportunity to give you feedback about what they want you to improve. After holding an initial meeting, you should ask them to prepare such feedback in advance, presenting it at the following meeting. I suggest asking for a volunteer among the members and letting them do the work on their own. The opportunity to participate in creating new products and services that address their problems and business opportunities. Avoid treating a Customer Advisory Board as a captive audience for your marketing team. You should not be trying to sell them anything during the meetings. Ensure you treat them as an ongoing community, with regular phone, email and face-to-face interaction. Always bear in mind that they will enjoy meeting each other more than they enjoy meeting you. Ensure space for that to happen, especially as it will build a community around your products. That’s it, short and sweet. Keep your boards simple too. Next time: Executive Sponsors and Project Sponsors.